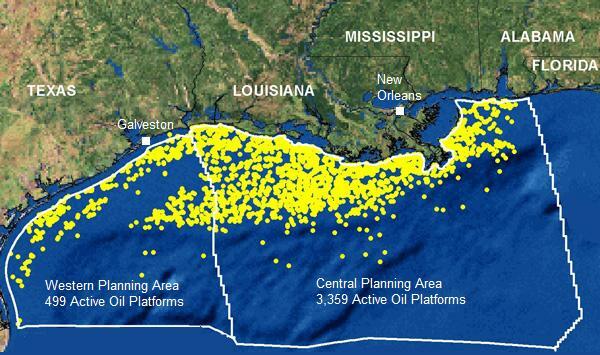 Screw the Environment: BP and the Audacity of Corporate Greed - This Can't Be Happening! 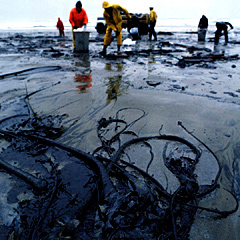 An oil spill under the ice would be impossible to stop or clean up. BP and other oil companies like Exxon/Mobil and Shell, which also have leases in Arctic Waters off Canada and the US, are actually trying to claim that the environmental risks of a spill in Arctic waters are less than in places like the Gulf of Mexico or the Eastern Seaboard, because the ice would “contain” any leaking oil, allowing it to be cleared away. The argument is laughable. This is not like pouring a can of 10W-40 oil into an ice-fishing hole on a solidly frozen pond, where you could scoop it out again without its going anywhere. Unlike the surface of a frozen pond, Arctic sea ice is in constant motion, cracking and drifting in response to winds, tides and currents. Moreover, the blowout in the Gulf has taught us that much of the oil leaked into the sea doesn’t even rise to the surface at all. It is cracked and emulsified by contact with the cold waters and stays submerged in the lower currents, wreaking its damage far from wellhead and recovery efforts. Finally, as difficult a time as BP has had rounding up the necessary containment equipment and personnel in the current blowout 50 miles from the oil industry mecca of Texas and Louisiana, the same task would be far harder to accomplish in the remote reaches of the Beaufort, far above the Arctic Circle, where there aren’t any roads, much less rail lines or airports. In fact, it was the remoteness of the Arctic staging area, and the lack of infrastructure, that has been the oil industry’s main argument against a mandatory simultaneous relief well drilling requirement for offshore Arctic drilling. The industry claims it would be “too difficult” to drill two wells simultaneously, as this would require bring in and supplying double the personnel, and two separate drilling rigs. In a hearing in Canada’s Parliament last week, Ann Drinkwater, president of BP Canada, told stunned and incredulous members of Parliament that she had never compared US and Canadian drilling regulations. In fact, whether by design or appalling ignorance, she had precious little in the way of information to offer them about anything to do with drilling rules, effects of spills, or containment strategems. All she wanted was relief from “expensive” regulation, so BP could go about its business of putting yet another region of the earth and its seas at risk in the pursuit of profits. “You’d think coming to a hearing like this that British Petroleum would have as many answers as possible to assure the Canadian public. We got nothing today from them,” groused Nathan Cullen of the left-leaning New Democrats, after hearing from the ironically named Drinkwater. The fundamental problem in the US is that politicians purchased by campaign contributions are unwilling to look at the real risks of offshore drilling, whether on the two coasts or up in the Arctic region. With luck, maybe at least the Canadian government will conclude that such drilling in their northern seas makes no economic or environmental sense. In both countries, the amount of oil provided from offshore drilling would, over the next decade, be less than could be saved by simply making automobile mileage standards stricter. All this is even more true when the drilling in question is in the fragile ecological environs of the Arctic Ocean.